The United Kingdom is made up of the states of England, Wales, Scotland and Northern Ireland. London is a major center for international business and commerce and is the leader of the three “command centers” for the global economy (along with New York City and Tokyo). The United Kingdom is the fifth largest economy in the world, is the second largest economy in the European Union, and is a major international trading power. Like many other industrialized nations of the West, the United Kingdom has sought to combine steady economic growth with a high level of employment, increased productivity, and continuing improvement in living standards. As the dominant industrial and maritime power of the 19th century, the United Kingdom of Great Britain and Ireland played a leading role in developing parliamentary democracy and in advancing literature and science. At its zenith, the British Empire stretched over one-fourth of the earth’s surface. The first half of the 20th century saw the UK’s strength seriously depleted in two World Wars and the Irish republic withdraw from the union. The second half witnessed the dismantling of the Empire and the UK rebuilding itself into a modern and prosperous European nation. As one of five permanent members of the UN Security Council, a founding member of NATO, and of the Commonwealth, the UK pursues a global approach to foreign policy; it currently is weighing the degree of its integration with continental Europe. A member of the EU, it chose to remain outside the Economic and Monetary Union for the time being. Constitutional reform is also a significant issue in the UK. The Scottish Parliament, the National Assembly for Wales, and the Northern Ireland Assembly were established in 1999, but the latter is suspended due to wrangling over the peace process. The UK, a leading trading power and financial center, is one of the quintet of trillion dollar economies of Western Europe. Over the past two decades, the government has greatly reduced public ownership and contained the growth of social welfare programs. Agriculture is intensive, highly mechanized, and efficient by European standards, producing about 60% of food needs with less than 2% of the labor force. The UK has large coal, natural gas, and oil reserves; primary energy production accounts for 10% of GDP, one of the highest shares of any industrial nation. Services, particularly banking, insurance, and business services, account by far for the largest proportion of GDP while industry continues to decline in importance. GDP growth slipped in 2001-03 as the global downturn, the high value of the pound, and the bursting of the “new economy” bubble hurt manufacturing and exports. Output recovered in 2004, to 3.2% growth, then slowed to 1.7% in 2005 and 2.7% in 2006. The economy is one of the strongest in Europe; inflation, interest rates, and unemployment remain low. The relatively good economic performance has complicated the Blair government’s efforts to make a case for Britain to join the European Economic and Monetary Union (EMU). Critics point out that the economy is doing well outside of EMU, and public opinion polls show a majority of Britons are opposed to the Euro. Meantime, the government has been speeding up the improvement of education, transport, and health services, at a cost in higher taxes and a widening public deficit. 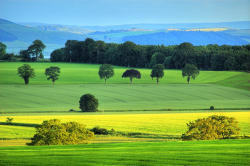 Most of England consists of lowland terrain, with some mountainous terrain in the north-west, north and south-west. The main rivers and estuaries are the Thames, Severn and the Humber Estuary. The largest urban area is Greater London. Scotland’s geography is varied, with lowlands in the south and east and highlands in the north and west, including Ben Nevis, the highest mountain in the British Isles at 1,344 m. There are many long and deep sea arms, firths, and lochs. There are nearly eight hundred islands in Scotland, mainly west and north of the mainland, notably the Hebrides, Orkney Islands and Shetland Islands. In total, it is estimated that the UK includes around one thousand islands. Wales is mostly mountainous. Northern Ireland, making up the north-eastern part of Ireland, is mostly hilly. The culture of the United Kingdom is rich and varied, and has been influential on culture on a worldwide scale. The UK has many cultural links with its former colonies, particularly those that use the English language. The origins of the UK as a political union of formerly independent states have resulted in the preservation of distinctive cultures in each of the home nations (Wales, England, Scotland, Northern Ireland). The United Kingdom has a vibrant tradition of theatre and literature, and names of British authors are worldwide famous, like Shakespeare. Music from the United Kingdom has achieved great international popularity since the 1960s, when a wave of British musicians helped to popularize rock and roll. Since then, the UK has produced numerous popular performers in far-ranging fields, as well as undergoing a renaissance in the ancient forms of folk music indigenous to England, Scotland, Wales and Northern Ireland The UK has also been influential in the technological, commercial, and artistic development of cinema and probably second only to the USA in producing the greatest quantity of world-wide film stars. Education in the United Kingdom is a devolved matter, and there are separate education systems in England, Northern Ireland, Scotland and Wales. Education (although not necessarily in the form of school attendance) is compulsory for all children between the ages of 5-16, though the UK Government announced in January 2007 plans to change this to 5 – 18 in England. Education in England, Wales and Northern Ireland follows the National Curriculum which was introduced by the British government under the Education Reform Act 1988. The National Curriculum includes the core subjects English, Mathematics, and Science and the foundation subjects: design and technology, information and communication technology (known as ICT), history, geography, modern foreign languages (MFL), music, art and design and the subjects of the basic curriculum, physical education, citizenship plus compulsory religious education (RE) which has a unique place in British law. Welsh is also a core subject in Wales. Scottish Gaelic may be taught to some pupils in Scotland. The Scottish curriculum has emphasized breadth across a range of subjects, while the English, Welsh and Northern Irish system has emphasized greater depth of education over a smaller range of subjects at secondary school level. Key stage 5 (unofficial): age sixteen to eighteen (Years 12 and 13) – the A-level academic qualifications (AS and A2), also Higher GNVQ and BTEC qualifications, or sixth form college courses. Students who wish to enter higher education must do either Advanced Level in England or Highers in Scotland. Students typically enter the university at ages seventeen in Scotland and eighteen in England, respectively. Most students must use the Universities and Colleges Admissions Service to apply the universities, however for some subjects there are different admissions services, such as NMAS for Nursing and Midwifery Diplomas. Many students in Scotland opt to remain in School for a 6th Year, and take Advanced Highers (Previously Certificate of Sixth Year Studies (CSYS) as the Scottish system uses the End of February for determining admission age many students are 17 when they start University despite staying for the 6th year). In Scotland, Scottish nationals do not need to pay for university tuition fees, it is paid for on their behalf by the Student Awards Agency for Scotland. Nowadays, students often take a gap year after leaving sixth form college. Many students go to work, thus the universities in the United Kingdom generally welcome this phenomenon, and as a result, universities would accept a deferred entry. Students may choose to attend the Further Education Colleges where a student might follow the National Vocational Qualification program instead of A levels or does the Scottish Vocational Education Committee courses. Further Education Colleges, however, are open to everyone, and those who wish to re-sit their examinations to improve their school-leaving qualifications as well as adult returners. Some specialist further education colleges known as Sixth Form Colleges focus on school level qualifications. The Scottish student entering the university may be aged seventeen and must have done at least four subjects at Higher Grade (equivalent to an English Advanced Subsidiary Level), some take up to 8, and achieve a minimum grade of two Bs and two Cs. The English student completes the Advanced Level in (usually) 3-4 subjects, generally taken at age 18 in preparation for admission. Students who attend the English universities do a three year course to earn a degree whereas those who attend the Scottish universities do a four year course, though there are variations on the time involved depending on the type of degree studied for. There are also sandwich courses in which the student may need to do a year more. The sandwich courses offer work placement which allows the students to work for a short period of time before they complete their courses. English universities specialize the subjects throughout the entire courses. Scottish universities, in contrast, do not specialize the subjects until the third year. Students who study in a Scottish university may leave after their third year; however, only an ordinary degree is awarded. Those who finish at the fourth year are awarded an honours degree. All universities award a Bachelor Degree to the students who have completed their undergraduate courses; however due to historical reasons the Scottish ancient universities in the United Kingdom which are the University of St Andrews, University of Edinburgh, University of Aberdeen and University of Glasgow (as well as the University of Dundee) award a Master of Arts (MA) degree to the arts students who have completed their undergraduate courses. Nonetheless, it is equivalent to a Bachelor Degree, and science and divinity undergraduates receive a Bachelor award. The so-called Oxbridge universities (Oxford University and Cambridge University) which are amongst the world’s oldest universities are generally ranked at or near the top of all British universities. Academic degrees are usually split into classes: first class (I), upper second class (II:1), lower second class (II:2) and third (III), and unclassified (below third class). In many universities ordinary degrees are often confined to vocational courses such as medicine and dentistry, or awarded when a student hasn’t passed enough modules to be awarded the honours degree.